Bourdain Quips: Wants Daughter to Eat Healthy. Says Batali/Paltrow Show, "Mesmerizingly Awful." I may be one of the only vegans out there who adores Anthony Bourdain. Well, maybe not, but I did start a thread on the Tony Bourdain website called "Vegans Who Love Tony," and it basically got bashed by foie gras lovers and parts-unknown eaters galore. Anyways, I do love Tony. I have read and unapologeticlly loved, Kitchen Confidential and his follow-up book The Nasty Bits. Both great additions to my carry-on bag for a plane trip to Cali or train ride to DC. I also adore No Reservations, his culinary travel show on The Travel Channel, not that "other evil food channel," as Tony likes to joke in his blog. However, I do have for fast forward through those 'and now we're sauteing a cow's brain and liver' scenes. I know, reading about it makes you cringe. But if you've read Tony's books, you know his obsession for eating all-things-uncommon, origins way back to his youth. Tony used to gulp oysters and other strange things to get attention from his less-culinarily-adventurous family members. But enough history, onto the scoop-worthy Bourdain revelations. -Tony has a young daughter, and wife, and he wants his daughter to eat "healthy and delicious" foods. -Tony would love to do an Italy-themed "On the Road Again" style tour with Mario Batali, but he thinks the show on PBS with Gwyneth Paltrow and Mark Bittman, basically sucked. My Commentary: Wow. Mesmerizingly awful? I'll admit Mark Bittman, self-proclaimed vegan thinker, but not eater, does come off a bit screwy, but that's part of the PBS-produced, entertainment. And although Gwyneth and Claudia seem to be luke-warm friends at best, Mario brings the whole twisted group of misfits together for an entertaining, yet oddball travel and foodie show. But Tony probably has higher standards. He is the expert. And gosh a Bourdain/Batali in Italy show would be awesome. I heard Oprah wanted to come too....hmmm. My Commentary: Yay Tony. You may eat calf brains and foie gras, but you know better for your daughter. You may have lost your healthy eating standards for yourself long ago, your thirst for a good dry Papaya Dog and Papaya Drink is still strong I guess, but for your daughter: healthy eating ambitions! The world is alright. My Commentary: You'll have to read the interview-in-full to read his entire analysis of Alice. But for the most part, I don't totally agree. Alice Waters was amazing in her day. But to stand in Tony's corner, I do think that the movement of healthy kids has gotten so dire, so fast, with childhood obesity becoming a forefront issue. Alice Waters is amazing, but the modern day fight need a swifter, more forward-thinking mind, more forward than the concept that school-based farm plots and such will save the kiddies and win the obesity battle. No hate mail though please. I do love Alice, I'd love to sit for a chai and organic farming chat with her. Read the entire interview: Chewing the Fat-No Reservations With Anthony Bourdain, by DCist. Read my review on the Spain: On the Road Again show, Tony may not agree, but oh well. Good fun. 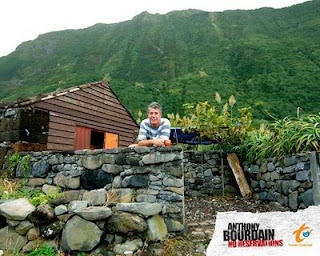 Photo credit: wallpaper from Travel Channel, Anothony Bourdain Website.